Is Replacing An iPhone Screen By Yourself A Good Idea? Apple produces some of the most striking and thin mobile devices in the market. A lot of people say that the trade-off is durability. They don’t usually fare well when it comes to apathetic use. This is also the main reason a lot of people use a case to protect the display from cracking when it is accidentally dropped. The older iPhone 4, 4S, 5 and 5S were sandwiched between 2 pieces of glass. The iPhone 4 and 4S are the 2 models that have been reported with more fatality than any other iPhone that was ever released. We all love the iPhone for its ease of use, great performance and the comprehensive App Store. However, one should also understand the fact that they are expensive, maintenance could be high and should be handled with care. 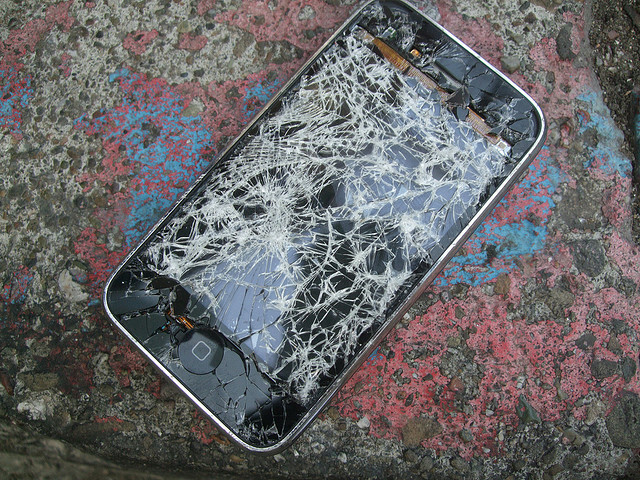 Cracked screens are one of the main reasons many have to walk in to a phone repair shop. If your device is covered under warranty, you can get a free replacement from Apple. Geniuses at Apple Care can also replace the broken display on your phone, as you wait. If your device is not covered under the 1 year or the extended warranty, Apple will not fix your device for free. – Can an Average Person replace the Display on an iPhone on their Own? Short answer: If you are someone who knows how to use a screwdriver, but have zero mobile repairing experience. Don’t even think about it. Take your phone to a licensed repair shop or a Genius Bar. If you take a close look at the screws on your iPhone, you will notice that they are unique and you can not come across one in mobile devices that are not made by Apple. It’s called the and Apple specifically designed it to discourage people from opening the iPhone. So if you want to replace the display on your own, you will need a special type of screw driver. You need to understand how the iPhone’s display is built. In many phones, the display unit (digitizer) is protected by an external glass. The digitizer is the LCD unit that is responsible for converting your touch actions into signals that your phone can comprehend. In an average Android phone, the protective glass and the digitizer will be 2 separate parts. However, on the iPhone, the protective external glass and the digitizer are glued together. This is done, to improve clarity and also prevent dust accumulating behind the glass. This means you will have to buy the glass and the digitizer as one part. In many cases, when the display breaks. It’s not actually the display that breaks, but rather the external glass. In many Android phones since the protective glass and the digitizer are 2 separate parts, it might be possible for one to actually replace the cracked glass on their own, but it’s a bit complicated with the iPhone for sure. One could buy the digitizer from an online store like eBay or listing websites like Craigslist. The problem with buying iPhone parts on the internet is that, people just want to sell off useless parts for money. All they need is your money. Even if it works, you would still not know whether it’s genuine or a cheaper, low-quality product. We have also mentioned above that the glass and the digitizer should be one piece. You could see a lot of sellers online who sell them separately. However, the special kind of lamination that Apple does is simply not achievable by us at home. If your device is not covered under warranty, you are better off fixing your device by a licensed repair shop, where the repair cost will be relatively low and you could be sure that your phone is in safe hands. The method to open the iPhone could vary depending on the model you have. For instance, the iPhone 4 and 5 might need an help of a suction cup and blade to remove the panel, whereas the iPhone 6 need a slightly different approach. Opening up an iPhone is not that hard. However, to replace the old parts with the new ones and be extremely careful with the ribbon cables and connectors could be really hard and definitely need professional help. If you want to know how to replace the display or simply how to open your iPhone, there are a lot of useful videos on YouTube that could help. However, as we mentioned earlier, if you are not sure about what you are doing and have no experience repairing phones. Just leave it to the experts.